A look at the local papers sometimes throws up some unexpected gems: stories that illuminate real life in the community, rather than the more artificial and mannered activities of politicians and their kind. Here’s a case of some very rough justice on a man who was held to be failing in his duty to allow the poor to glean his fields after harvest. Presumably, he wanted to cut his costs of feeding his own stock, even if the village poor went hungry. 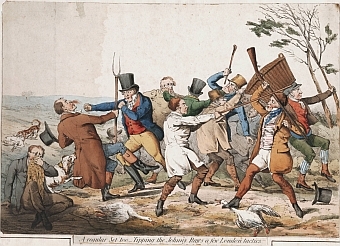 A Lanshall man who was severe on the poor, by with-holding the corn from them, and not suffering them to glean or gather up the loose-corn dropped by the harvest-men, but would turn in his hogs and cows to eat it, was, on his return from Sudbury market, met in a dark narrow lane by several men in disguise, who pulled him from off his horse, and beat him in a most inhuman manner, then dragged him through a little river which ran by the side of a lane, after which they swore they would hang him up to dry; which they did, and then left him, saying they had stopped his oppressing the poor any more. A person who happened to be behind the hedge, and heard what passed, but durst not interpose (as there were seven or eight of them) lest they should serve him down in the same manner, immediately cut him down, and another farmer coming from market at that instant, they took him to an adjoining house, where by proper care he was brought to the use of his speech, but is so dangerously ill from the bruises, that it is thought he cannot live. What the onlooker was doing behind the hedge is not mentioned! This entry was posted in Tid-bits. Bookmark the permalink. My grandfather was a Norfolk farmer. His grandfather was said to be so deeply unpopular with the local villagers that after he was buried they came out and jumped on his grave! Oh dear! Still, at least they waited until he was dead.